This centre is located in a modern building in the town of Rueil-Malmaison, located just 12km from the heart of the French capital, Paris. Serviced private offices, coworking spaces and virtual office options are available, and all are on flexible terms with all-inclusive billing for utilities helping to make your payments more manageable. Be inspired by what this centre has to offer, and spend your working days enjoying working alongside like-minded creative thinkers. 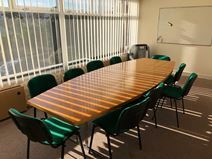 Two storeys of pleasant office accommodation in a small modern centre with reception and conference rooms. The centre is located amidst attractive park lands near to the prestigious business district of La Defense and a short way from central Rueil Malmaison. This space offers an abundance of excellent amenities to enhance your company's operations: 24-hour access, conference facilities, parking, natural light, and more. There are also events spaces at close quarters to the site where you can host conferences, conventions and presentations with ease.